In Ontario, the Occupational Health & Safety Act (OHSA), regulates safety in the workplace. In particular, regulation 851 focuses on industrial establishments. Electrical work falls under the Electricity Act (S.O. 1998, chapter 15). Section 25(2)(h) of OHSA, states that “…an employer shall…take every precaution reasonable in the circumstances for the protection of a worker.”. The expected precautions typically include as a minimum complying with the applicable electrical code for all electrical installations. In Ontario, the “Ontario Electrical Safety Code” includes the Canadian Electrical Code (CSA 22.1), with some Ontario-specific amendments. While it appears simpler to use, the second method is applicable only when some specific constraints are met regarding the available short-circuit current and the fault clearing time (FCT). For instance, some of the categories listed in Table 4B read: “Maximum of 25 kA short-circuit current available; maximum of 0.03 s (2 cycles)fault clearing time; working distance 455 mm (18 in)”. Confirming these assumptions may be difficult, as someone must perform at the very least a short-circuit study and creating time-current curves (TCC)s for each location. Gathering the information required to perform those tasks usually necessitates a field survey of the installation. It is possible to perform the calculations by hand, but it is time-consuming and error-prone. 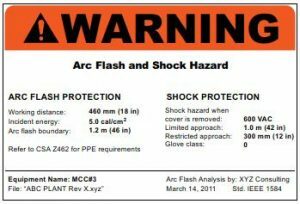 Electrical analysis software is now available that allows using the same field information to complete the short-circuit study, prepare TCCs and validate the selective coordination, as well as calculate the incident energy and produce detailed shock and arc-flash warning labels.